Colourful scenes with flaps to reveal details of life in Ancient Rome. Bright, clear illustrations show scenes such as a gladiator fight at the Colosseum, the workings of a Roman Bath and the Roman legion defending the farthest reaches of the Empire. 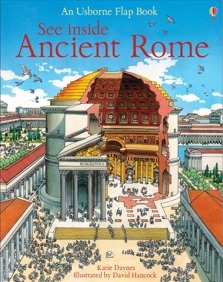 Includes a view of Rome today, with flaps to lift to uncover what stood there in the past. With over 50 flaps to lift revealing fascinating historical detail.